Blocked Or Breaking Through? Mixed Signals On Gun Bills : The Two-Way As the Senate prepares to take up Democratic-sponsored gun legislation, there's a report of a possible bipartisan deal on background checks for gun buyers. But other reports indicate that the gridlock over guns is likely to continue. 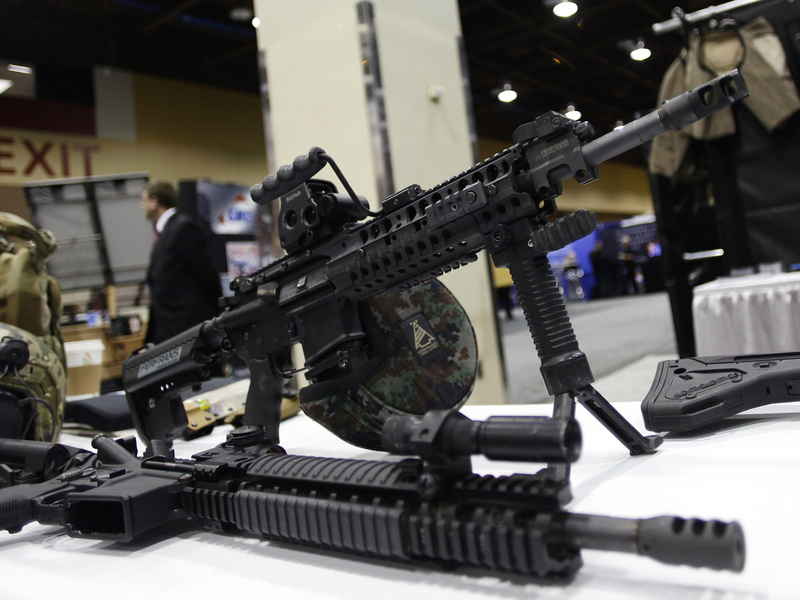 This AR-15 style weapon was on display in March at the 7th annual Border Security Expo in Phoenix, Ariz. It's among the type of weapons that advocates of new gun laws want to see banned. If this is President Obama's "make-or-break week on guns," as Politico declares, then it starts with considerable confusion about where things stand regarding the likelihood of passing new gun control laws. "Senate staffers say a bipartisan agreement has yet to be reached on universal background checks. That snarl may end up delaying a vote on gun legislation for another week, as lobbyists on both sides of the debate use the extra time to keep the pressure on." "In a move that could draw other Republicans as well as Democrats from conservative states who have not yet backed Obama's agenda, Sen. Joe Manchin III (W.Va.), a key Democratic broker, has spent the past few days crafting the framework of a possible deal with Sen. Patrick J. Toomey (R-Pa.). Manchin and Toomey are developing a measure to require background checks for all gun purchases except sales between close family members and some hunters." But as NPR's David Welna reported Monday on Morning Edition, five Senate Republicans are vowing to filibuster Democratic-sponsored gun legislation. So expect some zigs and zags this week in the Capitol. The president takes his case for new gun control laws to Connecticut on Monday. That's the state where 20 first graders and six educators were killed last Dec. 14 by a gunman at their elementary school in Newtown. Last week, Connecticut Gov. Dannel Malloy, a Democrat, signed new laws intended to ban the sale of assault-style weapons and large capacity ammunition magazines in the state, among other things.